Homeschooling Mom of Four: She's a Teenager! She was born on September 10, 2000 in the early afternoon. I had slept well the night before and headed to the hospital that morning. The labor and delivery were uneventful except that my sister had to step in for Doug as he wasn't doing so well on his own feet! 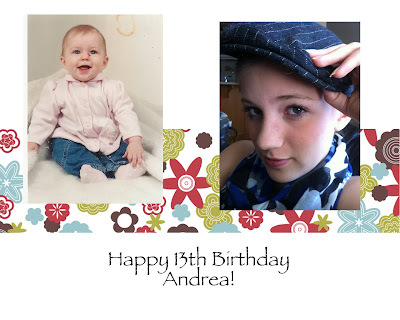 She was named Andrea Shirley, as a namesake to my mom who had passed away 14 months earlier. The past 13 years have been amazing with Andrea. She is beautiful inside out and is always looking for ways to help me. She is an exceptional big sister to Arianna and especially Sarah. Being that they're only 16 months apart, she and Joshua get along fairly well also. She has her own sense of style and I love that she doesn't let the fashion trends guide how she dresses or acts. She is confident in who she is and I'm pleased with her sense of being. She exceeds my expectations as far as school goes and I'm very proud of how well she is doing. She loves playing piano and singing and will be co-leading a worship service this coming weekend. I'm excited to see what God has in store for her life. She is becoming a lovely young lady and I can't wait to see what this coming year holds for her!